Yesterday we (the Crafty girls) had our Christmas get-together and also celebrated two belated birthdays for Fran and Kelly. We went for High Tea at Applewoods in Delta. The tea was delicious and we had a great time! Afterwards, we went back to my place to relax, visit and have our Christmas gift exchange. Thanks girls for a wonderful time! And thanks for all the lovely gifts!! Besides the usual gift that I give the girls from my kitchen (raspberry jelly, relish, red pepper jelly and cookies), I gave them each a sampler pack of twine from the Twinery. I just love this twine and so do the girls! We talked about having a card workshop in January featuring ... you guessed it ... TWINE! So with that in mind, over the next while I am going to make a whack of cards with twine and then they can choose four or five that they'd like to make in the workshop. Here's my first quick and easy CAS card using Lemon Drop twine ...and also using my new stamp set from SU! "Every Little Bit". 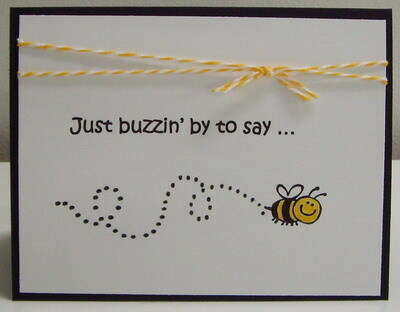 The sentiment is computer-generated "Just buzzin' by to say ..." and on the inside it reads "Happy Bee-Day". Hope you like. I printed the sentiment onto Whisper White cardstock. I stamped the bee in Basic Black ink. I used a pencil to draw a loopy line to represent the bee flying and then using the thick end of my Basic Black Stampin' Write marker to make dots all along the loops. After letting it dry thoroughly, I erased the pencil marks. I colored in the bee with Stampin' Write markers and then wrapped two pieces of Lemon Drop twine around the top, tying a knot just off center. I used sticky strips to mount the front panel onto a card base of Basic Black cardstock. I stamped another bee on the inside panel on the bottom right-hand corner and colored it with Stampin' Write markers; then mounted the inside panel to the card base.